Rock Bayard. The mythical Bayard rock is a monolythical peak that stands loose of the plateau by only a few meters. According to the legend, the rock was formed by a horse named Bayard when it was on the run for the army of Charles the Bold. With one single stroke of his hoof, the horse split the rock off from the plateau... that's how the story goes. The opening is so narrow that the road splits in two to enable cars to pass the rock on both sides. Meuse. The Meuse river was and still is one of the most mighty and most important streams in Belgium. In earlier years, the river was indispensable for the transport of people and goods when the river was the only way to move them over long distances and in large quantities. Nowadays, the stream serves also more touristic purposes: pleasure boats and river cruises with the so-called 'croisières". 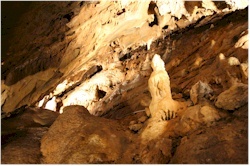 Cave "la Merveilleuse". This cave was discovered by coincidence in 1904 during works at the former regional railroad. Pretty quickly, the cave was arranged to receive visitors. The well maintained paved paths and stairs make the cave very well accessible [more info]. Cableway. The cableway is a fast alternative for who doesn't fancy to take the stairs to the citadel of Dinant. The entrance is located on the right side of the church. It also gives you a very nice view on the church and the town. Charles de Gaulle brigde. This has always been an important crossing of the Meuse river and the first fixed brigde was already mentioned in the 9th century. Throughout the centuries, the bridge has been regularly destroyed and rebuilt. There is also a deeper meaning linked to the bridge than just a mere crossing. In 1466, on order of Charles the Bold, 800 citizens of the town were tied two-by-two and then thrown off the bridge. The current bridge is dedicated to Charles de Gaulle, who got injured during the defense of the town in 1914. A statue of the general has been erected on the left bank of the river.